Our Villa Est is on the pool side: located in the left area of the complex, its veranda and balcony opens directly onto the pool, next to a centenary olive tree. With the other villas, it shares the pool, the garden and the gazebo, but it keeps its own independence and privacy. We provide our guests with two towels per guest (a large one and a medium-small one) , together with one pool towel per guest. We also provide bedsheets and bedcover, and all beds will be ready and prepared to be used at your arrival. We offer free Wi-Fi all over the complex. Our Villa Calicanto is something special. It is our little corner of paradise in the wonderful island we live in, Sardinia: we would like it to be a special place for you too. As you may see in the video linked at the very bottom of this page, it is a beautiful complex of four homes with an eco-conscious heart. This means that you will rest in the magical light, calm and exceptional comfort of a luxurious house which respects you and the amazing Mediterranean environment around you: the nearby Cannesisa beach with its crystalline, turquoise water, the different greens of the scrub in the coast, the clean breeze coming from southern Sardinia. Our gentle, peaceful place is a unique, charming private 4-villas eco-residence, Villa Calicanto, built in the utmost respect and beauty. The villas in front of the pool are Villa Est and Villa Sud: the villas that opens on the garden at the back at the residence and have a partial side view of the pool are Villa Ovest and Villa Nord. The villas are all identical: only their position changes, as shown in the map, and each has a dedicated page and calendar. Villa Calicanto is located in Torre delle Stelle, at about 35 minutes from Cagliari. The residence has a shared pool and is immersed in a shared green lawn with olive trees. It is 300 m far from Cannesisa beach; you can enjoy walking everyday to the seaside, and breath the fresh, deep salty air of the mediterranean sea within 5 minutes. Being on the coast gives you also the possibility to swim in some of the most beautiful shores in Sardinia (and in the world!) within a 15-30 minute drive; to explore the different facets of the main city of Cagliari; or indulge in the simple luxury of relaxing at home, in a place that nurturs your spirit and your body. We believe that the most beautiful holidays are places of the heart, and we would love to welcome you in our Villa Calicanto, the place where our heart is. As a family of five, we personally take care of our home, to give you the maximum of comfort and of ecologic consciousness on the Mediterranean environment in Torre delle Stelle. The bedroom area on the second floor (with two bedrooms: one master, one twin) offers panoramic views of the hill surrounding Torre delle Stelle. The lightfilled ground floor opens on a patio, from where to enjoy Mediterranean-scented dinners al fresco. The two bathrooms, the laundry facilities, the functional, and well equipped kitchen, and the bright open-space living room are extremely efficient energy wise (30 kWh/m²). They have been built with ecologic and natural materials (i.e. natural paintings) and decorated wherever possible with traditional Sardinian colours and crafts, such as the gorgeous handmade embroidered curtains. The large garden with secular olive trees, the shared pool with its gazebo, the Cannesisa beach nearby and all the amenities of the coast of Torre delle Stelle make our Villa a place of peace. A space where the bluest of Mediterranean Sea and the greenest of consciousness meet, in harmony. Two towels per guest (a large one and a medium-small one) are provided, together with one pool towel per guests: we also provide bedsheets and bedcover, and the kitchen is fully equipped and furnished. We will hand in our villa ready to live in at your arrival! We offer free Wi-Fi all over the complex. Villa Calicanto is our home: it is a place we love so much and we expect our guests to respect it and the labour of love that is behind it. At Villa Calicanto we are committed to living in a truly sustainable and beautiful way. Sustainability at Villa Calicanto means a kinder way of life which makes your holiday exceptionally comfortable as well as light on the island that welcomes you, Sardinia. It also means to be respectful of other guests, their peace and Holiday, and of the nature we live in. We do our best to continually improve our practices and encourage our guests to do the same. •Regularly recycle garbage and if possible buy goods with minimum and/or recyclable packaging. •Reduce car traffic: enjoy the local coast and its amenities, walk whenever possible (sun and distances permitting!) and drive preferably off peak time. •Stay Local, Eat Local, Buy Local, See Local: explore Southern Sardinia's possibilities - we will be happy to give you advice! •Relax & switch off – enjoy living lightly: turn off any electric units when you are not home; use the advantages of the passive house - for instance, close the curtains to keep the temperature inside, and open them to let the natural warmth and light in; try reducing the use of heating and air conditioning, as the quality of walls and insulation will naturally form an efficient barrier which cools down or warms up all interiors quickly and releases very slowly; turn off some lights and the TV and make yourself cozy with a book - or sit in the balcony or in the veranda, just looking at the stars (from which Torre delle Stelle takes its name! ); use the washing machine and the dishwasher when fully loaded, and prefer the ecological settings and programs on both devices; enjoy showers and use fresh water sensibly and responsibly; use appropriately the double flush button; opt for ecological mono-doses of detergents whenever possible. •No damage is done to property or its contents. •The property and the furnishings, kitchen equipment, crockery, glasses, barbecue, stoves, bedding and towels and all textiles are kept and left clean and in good condition: nothing is lost, left dirty, damaged. •Nothing is done that may be reasonably considered to cause a nuisance or annoyance to the owners, to the other guests in the residence, and/or to any other occupier of adjoining or neighboring properties. •No illegal activity, pets or collection of rents or services is done during the stay. •No extra people are staying in the Property than the ones expressly authorised and confirmed by the owners and other residents. •No significant change happens in the makeup of the group during the stay in the Property. •All debris, rubbish and discards are placed and regularly recycled for collection during the stay in the dedicated rubbish bins and bags outdoors and separated according to their categories following the given explanations upon arrival. •All dishes and kitchen tools used are placed in the dishwasher and cleaned: the dishwasher and its filters are kept clean. •All keys are left on the kitchen table and unit is left locked. •All charges accrued during the stay are paid prior to arrival. •No belated arrival and/or departure happen and the agreed check-in and check-out times are respected. If the arrival is belated, notice of such delay is immediately communicated to the owner. •Nothing other than reasonable amounts of ecological/biodegradable toilet paper is flushed. The water recycling system is very effective; however, it will clog up if improper material is flushed. No improper products should be flushed at anytime: dedicated bags are provided. If such provisions are not met, the damage(s) and losses will be estimated and the cautionary deposit will not be returned in part or fully. For instance, for leaving garbage in the house and/or in the bin area incorrectly recycled and/or in large quantity the fine is of 50 euro. Samely, for leaving the kitchen and/or dishes and/or the barbecue dirty and unclean the fine is of 50 euro. We recommend our guests to take travel insurance for the trip to ensure that each member of the group is covered by comprehensive travel insurance (including cancellation, flight delays, loss, theft and damage to baggage and other property) and health insurance (including evacuation and repatriation coverage). Our guests take all necessary steps to safeguard their personal property and safety. No liability to our guests is accepted in respect of damage to, disappearance, theft or loss of such property and of your own person (as well as minors). Ciao! Born in Sardinia and raised on a steady diet of pecorino cheese, poems and curiosity, I left my island to study and live on other islands and cities of water - always to come back at some point. Such is the enchantement of this land... worry not, it will put a spell on you too! Villa Calicanto is my family summer house, home to wonderful moments of peace and happiness: it is a place that as family we all cherish in our hearts and which we would like you too to call home. Benvenuti! Villa Calicanto is the first and only ecologically and sustainably built holiday residence rented in Sardinia, which we designed and lived in with so much love and care. As family we shared some of our happiest memories there; with this spirit we open our beautiful home with an eco-conscious heart to like-minded (and like-hearted ;-) ) guests. You will rest in the magical light, calm and comfort of a luxurious house which respects you and the amazing Mediterranean environment around you: the nearby Cannesisa beach with its crystalline, turquoise water, the different greens of the scrub in the coast, the clean breeze coming from southern Sardinia. Our villa, which is one of the four villas located in the residential complex Villa Calicanto, offers all the comforts of home in a intimate, fully furnished accommodation on the coast. Our Villa is perfect for couples, groups of friends and families. We accommodate up to 4 adults (or two adults and two children) but it is possible to accommodate a 5th guest if s/he is a child under the age of 3: for them we have a dedicated baby cot and a high chair. It is also possible to book larger groups in case the other villas in the residence, which we also manage, are available. Villa Calicanto is located in Torre delle Stelle, at about 35 minutes from Cagliari. Being on the coast gives you the possibility to swim, surf, or simply read a book and get Golden-tanned in some of the most beautiful shores in Sardinia (and in the world!) within a 15-30 minute drive; to explore the different facets of the urban life in Cagliari; to hike in the near Settefratelli Reserve; or indulge in the simple luxury of relaxing at home, in a place that nurturs your spirit and your body. At Villa Calicanto we are committed to living in a truly sustainable and beautiful way. Sustainability at Villa Calicanto means a kinder way of life which makes your holiday exceptionally comfortable as well as light on the island that welcomes you, Sardinia. We do our best to continually improve our practices and encourage our guests to do the same. •	Regularly recycle garbage and if possible buy goods with minimum and/or recyclable packaging. •	Reduce car traffic: enjoy the local coast and its amenities, walk whenever possible (sun and distances permitting!) and drive preferably off peak time. •	Stay Local, Eat Local, Buy Local, See Local: explore Southern Sardinia's possibilities - we will be happy to give you advice! •	Relax & switch off – enjoy living lightly: turn off any electric units when you are not home; use the advantages of the passive house - for instance, close the curtains to keep the temperature inside, and open them to let the natural warmth and light in; try reducing the use of heating and air conditioning, as the quality of walls and insulation will naturally form an efficient barrier which cools down or warms up all interiors quickly and releases very slowly; turn off some lights and the TV and make yourself cozy with a book - or sit in the balcony or in the veranda, just looking at the stars (from which Torre delle Stelle takes its name! ); use the washing machine and the dishwasher when fully loaded, and prefer the ecological settings and programs on both devices; enjoy showers and use fresh water sensibly and responsibly; use appropriately the double flush button; opt for ecological mono-doses of detergents whenever possible. Beautiful bathrooms with handmade tiles, decorated with a traditional symbol of prosperity, the Little Hen. Beautiful villa, fantastic detailing, built by the architect owner for his daughters, one of whom now manages the rental. Friendly helpful everything you could want. Local beach 5 minute walk away. 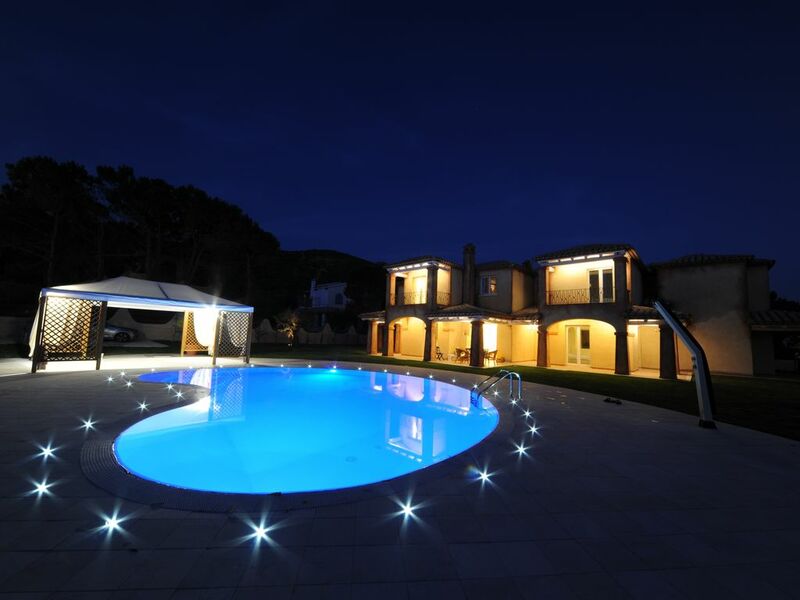 Beautiful, clean, well cared for villa in the heart of rural south sardinia. Definitely returning! From the moment I was in touch with Valeria (the owner) I knew that we were onto a winner. She was very prompt, informative and accommodating. She dealt with my endless questions very patiently. They, very helpfully, recommended a local car hire company who were fair and honest. No hidden added extras and a discount was given to the villa. The villa itself is stunning. Well stocked, clean and cool. We particularly liked the stove top coffee machine!! The pool was warm and clean. The pool cleaner and gardener came weekly, and the recycling was far more regular than in England. We were lucky enough to be there when 2 other English families were staying in the other villas and so our kids played for hours in the pool. They provided bbqs which also meant that we had a lovely evening with the other villas using the local meat from the supermarkets. Very tasty. Valeria gave us many suggestions for day trips and where to eat and visit in Cagliari. The highlight for us was a boat trip (7 adults and 4 children) where we jumped off board and snorkeled around the boat and rocks. The owner cooked some traditional sardinian spaghetti and Prosecco was provided!! Don't be late for it, one of the party was late and the owner was not impressed! Torre Del Stelle is not touristy, which is great. Used by Italians coming for their holiday so what you get is authentic. The beaches are beautiful. Palmira beach was wonderful for snorkelling and you could walk to the supermarket and pizza restaurant. Note it closed every afternoon. We found you always had to take an umbrella for the beach both for the sun and for the wind. I would definitely recommend Villa Calicanto and the surrounding area. Thank you Valeria, it was a wonderful holiday and your villa made me want to white wash everything at home. So classically clean and beautiful. We recently spent a week in the Villa managed by Valeria and her family. We had a great time, the accommodation and grounds are kept in immaculate condition. The accommodation offers plenty of space, style and convenience. We were welcomed warmly even after being delayed by a few hours, given a tour of the house and provided with the information we needed about the local area. Throughout the week, Valeria and her family were very helpful and responded to all of our questions. The location of the villa is very tranquil, the olive trees and beautiful pool make for a stunning backdrop for evening barbeques. I have two young children who also had a superb week. We used Torre as a base to explore the coast between Cagliari and Villasimius. We would most definitely go back! Thank you for a lovely holiday. We had a fantastic week with Calicanto as our base and true home from home. Valeria and Ezio ensured that everything was perfect and gave great recommendations for restaurants beaches etc. The Calicanto app meant we found places with ease and we explored much of the South of the island. We always returned to the villa though for an afternoon swim which our son really enjoyed especially as this was the time other children would also be in the pool so they would have lots of fun together. We spent a wonderful couple of weeks in Villa Calicanto, Southern Sardinia. It was all we had hoped for – a peaceful and pretty setting, very well maintained and equipped, and ideally located for beaches, day trips etc. We have two young girls (10 & 7) who haven’t stopped raving about Sardinia. They particularly loved the swimming pool, which never really got busy despite being shared. You can walk to the local beach in 5 minutes, but I would suggest venturing slightly further afield to Villasimius (car is a must), where there are beaches to suit all needs, from small, secluded spots that offer great snorkelling, to vast swathes of white sand such as Notteri. We ate out at the local pizzeria a few times, which is fine for simple fare like pizza or steak (also good ice cream). For something a bit nicer Le Anfore just outside Villasimius is great for seafood. Driving – I would recommend having a sat nav, particularly if driving at night. There are road signs, but they are very easy to miss at night! We had a great day trip to the Is Zuddas caves near Santadi, which are pretty impressive and worth the drive. We then went on to the archaeological site of Nora, near Pula, and had an informative (and quite amusing) tour of the ruins. Again, well worth a visit, particularly as there is a decent beach next door. Cagliari is also worth a visit. Go early morning or evening and park near the port for convenience. Valeria and her parents were regularly on hand to give us help, advice, or just a friendly chat. They could not have been more charming, and really made the holiday special for us. We had such a great time at villa Calianto. The house itself is very quiet, clean and has, not to forget, a lovely swimmingpool. We all enjoyed our time there. The owners, Valeria, Ezio and Maria, are so polite and friendly! We visited lots of beaches during our stay, the nicest was for us Porto Giunco. In the evening, we often drove to Villasimius. We all four agree, that we will come again- maybe next summer holidays. Located at 300 m from the sandy beach and the turquoise sea of Cannesisa in Torre delle Stelle, a lovely village engulfed on the southern coast of Sardinia, our luxury eco-Villas offer the perfect setting for exploring the city of Cagliari with its shops and museums, the beaches around (Villasimius, Solanas) as well as enjoying a relaxing, eco-conscious vacation surrounded by the perfumes of the deep-coloured Mediterranean scrub. The village and the bay offer quite a few opportunities to enjoy water sports (i.e. sailing, canoeing) and outdoor activities: with its enviable position it is also a ideal place for exploring the area by biking or walking. Please notice that the sum of 300 euro in cash will be asked upon the check out in case of an unsatisfactory final check. This sum will not be required provided the following provisions are met: •	No damage is done to property or its contents. •	The property and the furnishings, kitchen equipment, crockery, glasses, barbecue, stoves, bedding and towels and all textiles are kept and left clean and in good condition: nothing is lost, left dirty, damaged. •	No damage is done to the walls, doors or windows of the Property •	Nothing is done that may be reasonably considered to cause a nuisance or annoyance to the owners, to the other guests in the residence, and/or to any other occupier of adjoining or neighboring properties. •	No illegal activity, pets or collection of rents or services is done during the stay. •	No extra people are staying in the Property than the ones expressly authorised and confirmed by the owners and other residents. •	No significant change happens in the makeup of the group during the stay in the Property. •	All debris, rubbish and discards are placed and regularly recycled for collection during the stay in the dedicated rubbish bins and bags outdoors and separated according to their categories following the given explanations upon arrival. •	All dishes and kitchen tools used are placed in the dishwasher and cleaned: the dishwasher and its filters are kept clean. •	All keys are left on the kitchen table and unit is left locked. •	All charges accrued during the stay are paid prior to arrival. •	No belated arrival and/or departure happen and the agreed check-in and check-out times are respected. If the arrival is belated, notice of such delay is immediately communicated to the owner. •	No damage is done to the water system (i.e. by flushing improper or excessive material).